Become a Certified Helen Doron English Teacher – the Best EFL Teachers in the World. Distinctive training. A life changing experience. Yes, studying to be a Helen Doron English teacher involves passing an intensive and challenging training programme, but it provides you with a unique experience that will enable you to bring out the best in people and yourself. Unique proven methodology. Game changing teaching. To become a certified HD English Teacher, you’ll be taught by elite trainers. 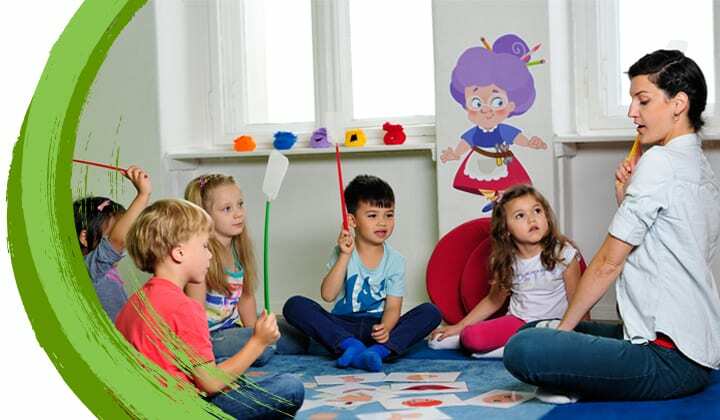 You’ll be able to impart our excellent, rich course material that teaches kids English as easily, naturally, and successfully as they would learn their mother tongue. Interesting in learning more about a teaching career? Over 5 full days, you’ll receive thorough training in the Helen Doron methodology. Is this a good fit? These two days will tell us, and you, if you’ve got what it takes to be a Helen Doron English teacher. You’ll learn about the methodology, familiarize yourself with the materials and how to teach the lessons. Take the First Step. Sign Up for a Training Course. We’ll help you find a spot in the next course at the time and place of your choosing. Courses are run throughout the year in many different locations, so there is sure to be one convenient for you. Once you receive our international diploma as an accredited HD English Teacher, you’ll be part of – and supported by – the world’s best EFL teaching team. There are 900 Helen Doron English Learning Centres in 36 countries around the globe! Now get ready to choose the career track you want around your lifestyle. You can tailor your working hours around personal and family commitments and grow within Helen Doron!